The following information has not been confirmed by Volition and is therefore not canon for the FreeSpace universe. EACa Auriga is main carrier of Earth Alliance from Inferno Nostos. It's based on older Orion destroyers. When the destruction of the Lucifer in the Great War caused the Sol-Delta Serpentis jump node to collapse, the GTA had several Orion class destroyers in Sol ready to fight the Shivan superdestroyer to the bitter end. Rather than scrap these ships as newer models were built, the Earth Alliance modified the destroyers, fitting them with a second hangar bay to increase their fighter capacity, and replacing the traditional hull armor with the EA's heavier plating. We can also conclude that the EA built a number new ships of this class from scratch, as nine units of this type have been identified in battle so far. 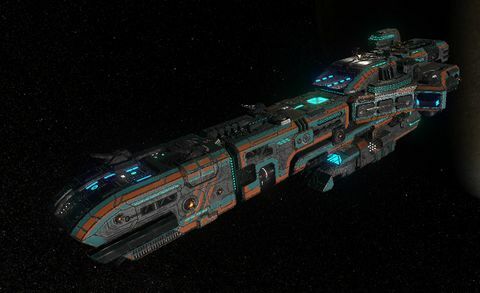 As a fleet carrier, the Auriga can carry over 180 combat spacecraft while mounting a number of medium beam and railguns to fend off cruiser and corvette attacks. Mirrored version was dropped from Inferno Nostos in favour of new mesh based on older design. Inferno Team decided that this ship needs to be something more sophisticated and fanciful than just Orion with second hangarbay. Contrary to previous comment, this ship is not based on GTHD Orion Mk2. It was made by mirroring current HTL Orion model from MediaVPs, than retiled to match EA fleet. It was replaced by different model in later patch. This page was last edited on 8 January 2019, at 09:13.